My Debut as a Member of Austen Authors! 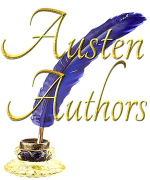 Recently I was honored to be invited to join Austen Authors, a wonderful group of dedicated Jane Austen Fan Fiction writers. Today is my debut blog on the Austen Authors page — where I address the question of “Why Does Jane Get All the Fan Fiction?” In other words, why aren’t we reading and writing fan fiction based on Melville, Dickens or Poe? These thoughts have been knocking around in my head for a while, so I hope you find them interesting. Why Does Jane Get All the Fan Fiction? Get my Newsletter, Dispatches from Pemberley, in your Inbox! New Audio Book Available — Narrated by Stevie Zimmerman! Five Star Review from Half Agony Half Hope Reviews! Darcy and Deception Now Available on Amazon! 4.5 Star Review for Christmas at Darcy House at Austenesque Reviews! President Darcy is Now Available on Audiobook!